However using the standard setup which specifies using Gmail's own SMTP server to send mail out, the message arrives in Outlook with a 'sent from user@gmail.com on behalf of kid@kidsname.com. Looks a bit messy and gives away the gmail username. You can stop that sent on behalf of from appearing by changing the Gmail settings slightly. Go back into the Send As setting mentioned above then click Edit info for the own domain name entry (kid@kidsname.com). Specify that you want to use the domain's own SMTP but delete the smtp.kidsname.com entry and change to smtp.gmail.com (yes yes, same server as before, but it doesn't add that sent on behalf of label sent like this). Use the user@gmail.com login and password, specify TLS and port 587. I've got 23GB free on this laptop and Symantec EndPoint Protection Small Business 12.1 keeps insisting I need to run disk cleanup to free some disk space. except I couldn't find that value in my registry. I did also note that in the Control Panel under Symantec LiveUpdate Settings > Update Cache, the max cache size was only 10MB so I bumped that up to 100MB. I noticed this particular server always gives an Unexpected Shutdown after I click Restart once the updates are loaded. Also if I manually choose to Restart. Couldn't see what was causing it until I came across this thread where a load of people with Blackberry Enterprise Server were having the same problem (this is a Dell Poweredge by coincidence too). Scroll most of the way down for the post from JakesRNC. Its a quick and dirty fix but does the job. 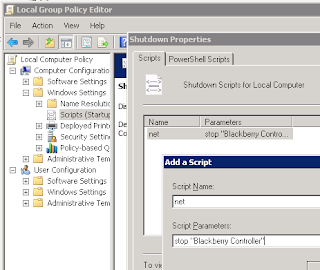 Putting 'net stop "Blackberry Controller" in the shutdown script for the server with Group Policy. 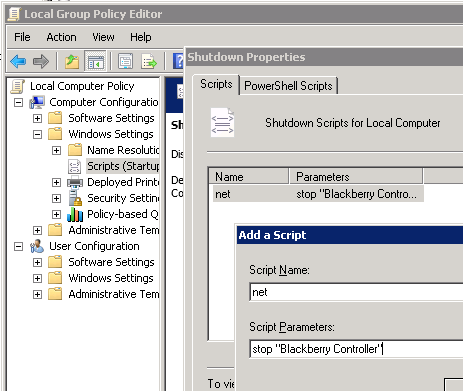 parameters = stop "Blackberry Controller"
That new locked down IE9 is giving me hell on the SBS servers. Latest was to stop me saving a licence file on a remote server I was logged into. No errors, just wouldn't open or save or save as. Simple to use, variety of formats and sizes and the QR works - shock! Tested successfully with red Laser on the iPhone. Its not often that I don't find an answer to an SBS admin question on Daniel Petri's excellent website. He's got a post about loading up ADSIEDIT to set a mailbox limit warning higher than 2GB. Basically the standard Exchange Server Manager won't edit the values higher than 2GB so you have to dive into obscure Active Directory attributes to load a bigger value. At one particular client that didn't work and he kept getting daily warnings, which in turn meant I got a daily prompt ;-) There is a global setting that affects all mailboxes fortunately and it worked at this particular client. Just completed an SBS 2011 migration from SBS 2003 using the Microsoft method. Two of the mailboxes failed to transfer correctly and I had to manually create and import them. Subsequently some staff were unable to email one of those mail accounts. They received an undeliverable error which showed the new server name but trying to route to the old 'First Administrative Group' on the 2003 server. Download Offline Address Book gave error 0x8004010F, not found. Create the new OAB with a different name. Then allocate it to the Mailbox Database. Going back to Outlook and clicking Download Address Book worked straight off and email routing was successful. "Taking IT apart is easy, putting it back together in the right order is what you pay for"
the hotfix dowload didn't actually work for me - was a Vista x64 version that reported incompatbile with SBS 2008.